Many coastal research labs, like the Louisiana Universities Marine Consortium, face increased flooding from rising seas. 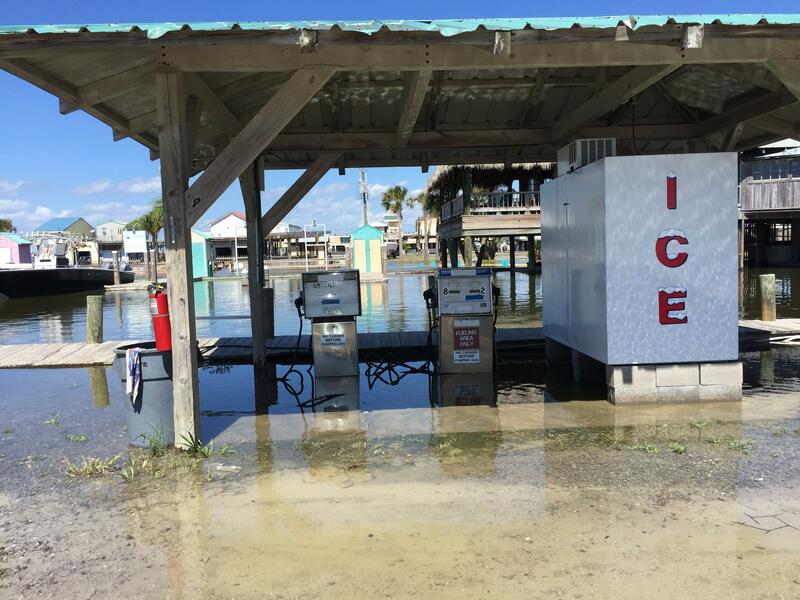 Coco Marina, a gas station near Louisiana Universities Marine Consortium, flooded during high tides ahead of Hurricane Nate last year. During a recent open house, cars packed the parking lot. Families and children streamed through the place, checking out aquariums with local fish and turtles, taking rides on the research vessels, and talking to researchers like coastal professor Alex Kolker. He showed them models of the Mississippi River and sediment cores to explain how fast the coast is disappearing. Due to a combination of sea level rise and natural subsidence (sinking land), the state is losing land faster than just about anywhere in the world. State and federal officials have built levees along much of the coast to protect populated areas. The Army Corps of Engineers, with state and local partners, recently built a big one right near the marine consortium, known as LUMCON. But as Kolker watched the construction play out on his way to work, the big backhoes and trucks moving dirt around, he realized one day that the giant wall was not going to protect the lab. "This is sort of an ironic situation," he says. The research lab whose work is helping Louisiana prepare for rising seas, among other climate impacts, will now have to cope with them itself. Since then, the lab grounds have started flooding more often. The building is already raised 15 feet off the ground in case of storms, but now the whole property floods during heavy rains and high tides. This happened about 75 times last year. Kolker and his colleagues often arrive at the end of the road to find standing water surrounding the lab. They must wait for it to recede, or sometimes go home and try to work from there. Kolker is making the most of it, using this front row seat to further his research. 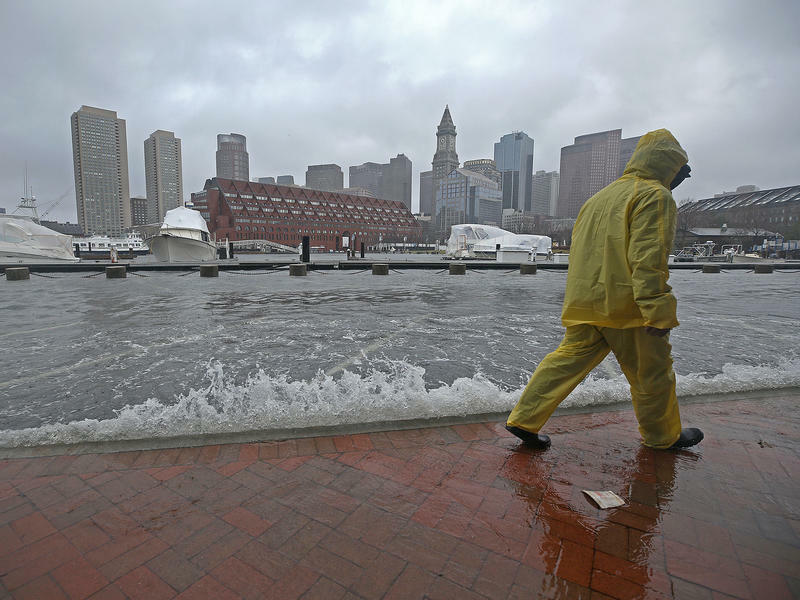 State data estimates that sea levels in this area could rise about four feet by 2100. Donald Boesch, professor with the University of Maryland Center for Environmental Science, says scores of coastal labs around the country are studying flooding, sea level rise and ocean acidification, research that is helping states make decisions about how to deal with climate change. He says these labs have never been more important, but now many of them are also flooding. In some places, including Mississippi, labs are moving to higher ground, he says. In others they're raising buildings up high, as in Texas, where a lab was hit by Hurricane Harvey. Boesch says even if carbon emissions are aggressively cut, limiting the worst impacts of climate change, sea levels will continue to rise for years to come, threatening not only marine laboratories but also places where people live. 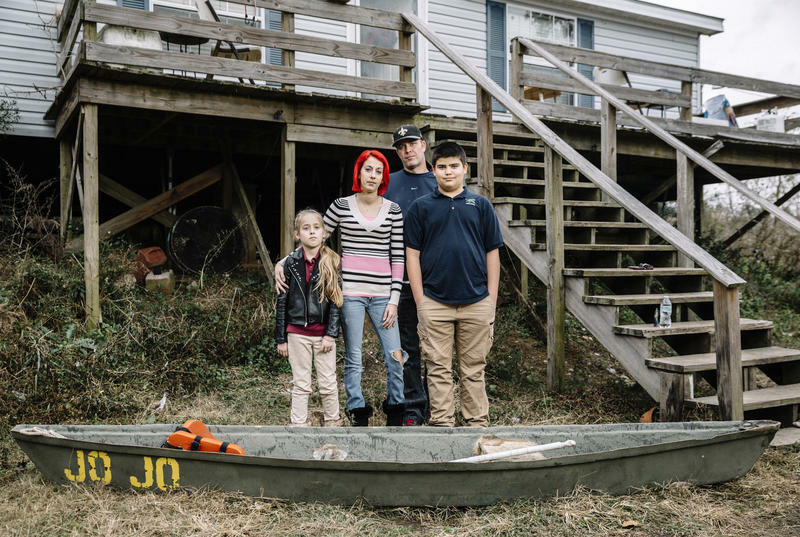 They are all going to face hard decisions, he says, "about whether they can provide improved infrastructure, or they need to move back, they need to retreat." In Louisiana, LUMCON director Craig McClain says retreat is one option, and he and colleagues are brainstorming others. Perhaps, he says, the lab could be permanently surrounded by water and "we have a dock somewhere else that people drive to, and then we shuttle people out to the center." The lab is already moving some of its bigger boats to safer ports inland, and trying to get a high-clearance military vehicle to drive through high water. Scientist Kolker hopes the lab can stay put. "I love being here," he says, "and as marine scientists, we have to be by the coast." Even if it eventually means taking a boat to work. With sea levels rising, many coastal research labs are helping communities to plan for what happens next. One problem is that now many of them are starting to flood - coastal research labs flooding. Tegan Wendland of member station WWNO in New Orleans has the story of one lab. 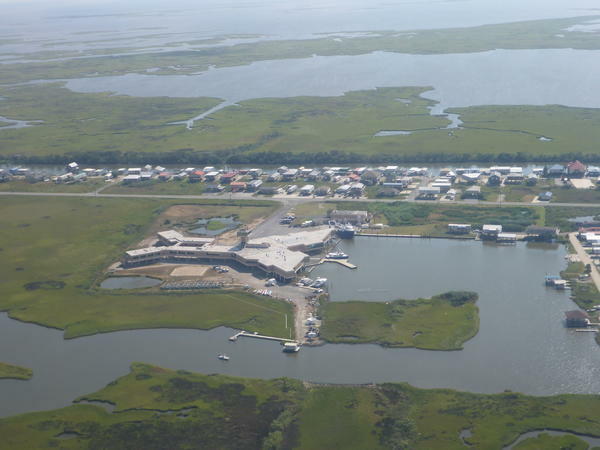 TEGAN WENDLAND, BYLINE: The Louisiana Universities Marine Consortium is a giant X-shaped building at the end of a gravel road about 80 miles south of New Orleans. It's surrounded by open water and grassy marshes. During a recent open house, cars packed the parking lot, and the lab comes alive. WENDLAND: Local families gather around a big table, and grad student Catherine Fitzpatrick shows them a model of the river. CATHERINE FITZPATRICK: The highest points are along the edge of the river. And those are our levees. You can look down on the other parts of the land because it's the highest ground. WENDLAND: The state has built huge levees along much of the coast. That's to protect people in cities because the state is losing land faster than just about anywhere in the world. One levee was built right near the lab. Professor Alex Kolker watched the big backhoes and trucks moving dirt around as he drove to work every day. And it dawned on him. ALEX KOLKER: That was when it really struck me that we were outside the levee system. WENDLAND: His lab was on the other side, unprotected from rising water. Then, the flooding got worse. The lab is raised 15 feet off the ground in case of storms, but now the whole property floods during heavy rains and high tides. It happened about 75 times last year. Kolker and his colleagues often can't get to work. They drive to the end of the road and find water. They have to stop, wait or go work from home. KOLKER: In a way, this is sort of an ironic situation. WENDLAND: It is giving this coastal scientist a front-row seat to study sea level rise. He measures rainfall and high tides, looking for patterns in the flooding. WENDLAND: We walk way out on a wooden dock in the middle of the marsh to check his tide gauges. KOLKER: Our gauges are down this hole right here that measures water level, temperature, salinity and the like. WENDLAND: Based on federal and local data, the sea level here could rise by about 4 feet by 2100. Professor Don Boesch is with the University of Maryland Center for Environmental Science. He says scores of labs around the country are studying flooding, sea level rise and ocean acidification. They're helping states make decisions about how to deal with climate change. DONALD BOESCH: There's never been a time when they've been more critical. WENDLAND: But now, he says, many of them are flooding. BOESCH: Even if we limit climate change, we're going to see continued sea level rise. And so not only marine laboratories, but resorts and tourist areas and places where people live are all going to have to face decisions about whether they can provide improved infrastructure that allows access and allows them to move up, or they need to move back. They need to retreat. WENDLAND: In some states, they're moving to higher ground, like in Mississippi. In others, they're raising buildings up high, like in Texas, where a lab was hit by Hurricane Harvey. In Louisiana, lab director Craig McClain says retreat is one option. They're brainstorming others. CRAIG MCCLAIN: Maybe it's just a center that sets in the middle of the water all the time, and we have a dock somewhere else that people drive to, and then we shuttle people out to the center. WENDLAND: They're already moving some of their bigger boats to safer ports inland and trying to get a high-clearance military vehicle to drive through high water. But scientist Kolker doesn't want the lab to move. KOLKER: I mean, I love being here. I don't know if it's called stuck, but as marine scientists, we have to be by the coast. WENDLAND: Even if it eventually means taking a boat to work. For NPR News, I'm Tegan Wendland in Cocodrie, La. This story is a collaboration with Reveal, the Center for Investigative Reporting, and PRX. You can share your own experience with increased flooding here.